Below is a description of each of the Top Ten Events with links to reports and photos. Clicking on an item in the list above, will forward you to that particular event. In 1902, William H. Nichols endowed the medal that was to bear his name, and the award was first presented in 1903. Since then the award has been perpetuated by the generosity of Dr. Nichols, his family, and the Nichols Foundation, Inc. The 2009 William H. Nichols Medal of the ACS New York Section was presented to Professor Carolyn R. Bertozzi of the University of California, Berkeley, at the Crowne Plaza Hotel, White Plains, NY on Friday March 13 2009. This is the 103rd Nichols Medal to be presented for distinguished research in chemistry. The gold medal was accompanied by a bronze replica and $5000. Professor Bertozzi received the Nichols Medal "For New Chemical Methods for the Study and Control of Biological Processes." Her award acceptance address showcased her determination to succeed in the field of chemistry and the need for seeking and accepting challenges. Over 200 chemists from academia and industry attended the day's events. Among the distinguished attendees at the dinner were Dr. Thomas H. Lane, 2009 President of the American Chemical Society, Dr. Anne T. O'Brien, District 1 Director, as well as three generations of the Nichols Family: Mr. David Nichols and Mr. C. Walter Nichols III (great grandsons of William H. Nichols); Mr. Charles Nichols, Mr. Michael Nichols, and Mrs. Sandra Nash (great, great grandchildren), and Mr. Gardner and Ms. Whitney Nash (great, great, great grandchildren). Professor Howard Hang of The Rockefeller University introduced Professor Bertozzi at the Medal Award Dinner. The award dinner was preceded by an excellent distinguished symposium that featured as speakers: Professors David Y. Gin, Memorial Sloan-Kettering Cancer Center; Alice Ting, MIT; Tom W. Muir, The Rockefeller University; and the Nichols Medalist Carolyn R. Bertozzi. The title of the distinguished symposium was Innovations in Chemistry Toward Advancing Biology. The Nichols symposium and banquet is an excellent opportunity for chemistry students to interact with industrial chemists, learn about cutting-edge research, and participate in recognizing achievements in original research. Donations from the Nichols Foundation and local industry are used to bring the students to this event. The Nichols Medal awardee is selected from many excellent nominations at an annual June meeting of the Nichols Medal Jury. The New York Chemistry Students' Association of the New York Section held its 57th URS on Saturday, May 2, 2009, at Pace University, Pleasantville, NY. Ninety two papers from 27 different colleges were presented in nineteen concurrent sessions. The areas covered were analytical, biochemistry, chemical education, environmental/green, inorganic, organic, nano- and surface chemistry, physical and polymer chemistry. Attendees were formally welcomed by Dr. JaimeLee Rizzo, Co-Chair, Students' Association Committee, who introduced President Stephen J. Friedman, President of Pace University, Dean Nira Herrmann, and Dean of the Dyson College of Arts and Sciences of Pace University. Dr. Sharon Lall-Ramnarine, Co-Chair, Students' Association Committee then introduced Prof. Barbara R. Hillery, the ACS New York Section Chair, and Prof. Ellen Weiser, who introduced the keynote speaker, Dr. Michael N. Alekshun of Schering-Plough Research Institute. The keynote presentation entitled "Contemporary Issues in Antibiotic Resistance: Problematic Bugs and the Therapeutic strategies Used to Treat Them" was well received. As a token of appreciation from the ACS-NY Section, the speaker was presented with an inscribed plaque commemorating the event. The group picture was taken and then students, faculty and guests attended the student presentations taking place in nineteen concurrent sessions. The students gave 15 minute oral presentations. Representatives from Pearson, Cengage, Maruzen, Pepsi, and On Assignment Lab Support attended the symposium, and tables were made available for these representatives in the reception area. The symposium concluded with a luncheon and an Award Reception including an ice cream social where students were presented with Certificates of Participation and mementos (water bottles). Student moderators were also presented with water bottles for their participation. It must be noted that the organizers of this event are superb fund raisers! They were able to cover all costs of the event through the generous donations of local industrial donors and publishers. The participation of high schools within the region of the NY Section in the Chemistry Olympiad attests to the great energy, enthusiasm and intellectual achievements of both students and teachers in this area. The New York Section has provided ongoing support for this program, which is integral to our overall outreach to area high schools and their students. In 2009 a total of 322 students from 56 different high schools registered to take the local exam, administered on March 6 (9 sites) and March 7 (3 sites). With a perfect score equaling 60, students in NY averaged 36.6, with a range of 16 to 57. Thirty students scored 49 or above. Based on the size of the New York Section, 20 students were allowed to continue to the National Exam level. Anna Chithelen, who had attended the 2008 Study Camp, had a free pass to the National Exam. The National Exam was administered at two locations, Purchase College of SUNY on Saturday, April 25, and Adelphi University on Sunday, April 26. Of the 916 students who took the National Exam 100 students attained honors and 50 attained high honors. These numbers were established by the national ACS. Of the 21 NY Section students who took the National Exam two obtained honors and one obtained high honors. Anna Chithelen, the one student who obtained high honors, attended the Study Camp in 2008 and was again invited to attend; however, a medical condition prevented her from doing so. It must be noted that running a program of this size in a section as large as the NY Section is a time consuming task. We are fortunate to have the organization skills of Dr. Stephen Goldberg, who has served as the Olympiad Coordinator since 1999 and as a National Exam proctor for two years prior that. 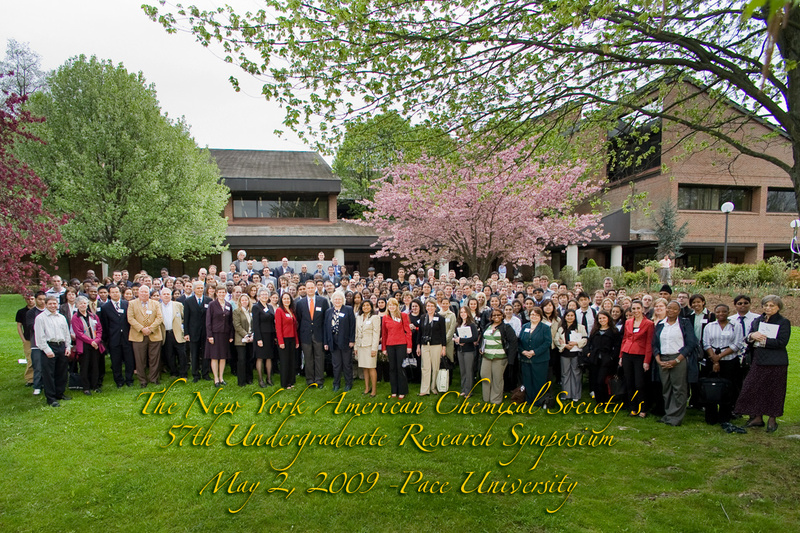 In keeping with the ACS objective of advancing science education and research, the New York Section has long been committed to the goals of Project SEED, and 2009 was another great year for us, with more students participating in SEED I and SEED II than any other section. The NY Section also encompasses part of northeastern NJ (Hudson Bergen) and has close ties with the North Jersey section itself; thus our Project SEED students worked in labs across the boroughs of New York and throughout northern New Jersey. Scientists from over 30 colleges, universities, laboratories, hospitals and research centers served as mentors during the summer of 2009. Among the success stories are five students from the NY Section who received the ACS Scholars award. Two of those are now studying at NY colleges, two at NJ colleges, and the fifth, also studying in NJ, had to decline the scholarship because she had been awarded a Millennium Scholarship from the Gates Foundation. Five students also received the SEED Scholarship, and all five have entered area colleges. On the road, 22 Project SEED participants traveled to Washington D. C. to present at the National Meeting of the ACS. All Project SEED participants presented at the Fifteenth Annual Poster Presentation that took place at Seton Hall University on September 21st, with about 100 students from the NY and North Jersey sections. The NY participants won 5 of the top 6 awards! The list goes on. Clearly Project SEED is expected to result in a blossoming forth, and we had an excellent example of that this year. One of our past participants was accepted into the Ph.D. program at Princeton University. His thesis advisor, impressed with his lab skills, inquired about his background and learned for the first time about Project SEED. Professor Jamie Link contacted Nadia Makar, our Project SEED coordinator, and the result is that Dr. Link and his colleague Dr. Michael McAlpine are hosting 4 students next summer. The New York Section's 5th exciting National Chemistry Day Event (October 24, 2009) was again held in cooperation with the New York Hall of Science in Queens. This continues a fruitful relationship with NYHOS and aligns with our section goal of growing and maintaining collaborations with other scientific organizations. NY has been fortunate to have Dr. David Sherman, Principal Research Specialist of Pepsi-Cola, to coordinate the events. For his work on National Chemistry Day, David received the Harvey C. Russell Inclusion Award at Pepsi's main office in Purchase, NY. The NY Section presented both Dr. David Sherman and the NY Hall of Science the Salutes to Excellence for their work with National Chemistry Week. The Section was told that the Great Hall, our normal home at NYHOS, would be under renovation until 2012, and we would therefore have to use the smaller Viscusi Gallery. Despite the space limitation, the event reached over 1200 children and their parents. Participating in the activities were 290 volunteers from a high school, 12 colleges and universities, and 7 local companies. New this year was a Bingo game in keeping with the year's theme: Chemistry - It's Elemental. The game took place in the NYHOS's auditorium, a first for us, and featured an interactive periodic table, with periodic table pens as prizes. And for the second year in a row both attendees and volunteers were thrilled by the presence of the NY Mets mascot, Mr. Met, who,transformed by a lab coat over his uniform, became our own Dr. Met! Since its inception 5 years ago, we have had a 105% increase in the number of hands-on and demo activities, a 140% increase in the number of attendees, and a 230% increase in the number of volunteers! Chemagination is a science essay and poster contest for high school chemistry students, grades 9-12, that asks them to address the question, 'What innovation or breakthrough in the field of chemistry will be important in the lives of teenagers 25 years from now." Students choose one of four categories: Alternative Energy Resources, Environment, Medicine/Healthcare, or New Materials and their entries are written as articles of 1000 words or less that might appear in a future issue of ChemMatters, a science publication for high school students. Students make a poster presentation of their articles on the day of the contest. This year's event drew thirty five posters contributed by approximately eighty five students from nine high schools. The Sixth Annual Chemagination contest began with welcoming remarks by Dr. Vijaya Korlipara, Chemagination Coordinator, Dr. Barbara Hillery, Chair of the New York Section of the American Chemical Society, and Dr. Richard Rosso, Chairman, Department of Chemistry, St. John's University. This was followed by the judging of posters. A panel consisting of three judges interviewed each group of students and selected the top two posters in each category. Judging criteria included scientific thought, creativity, clarity, thoroughness, and teamwork. The first and second place winners in each category were given trophies. All participants were given certificates of participation. Unlike the previous years, there was no regional Chemagination contest this year, a disappointment to many. Congratulations to all the students who participated in Chemagination 2009 with great enthusiasm. The Biochemical Topical Group has done an outstanding job of forming collaborations with other organizations, specifically the New York Academy of Sciences (NYAS) and their Biochemical Pharmacology Discussion Group, thus their listing here in the Top Ten. The combination represents a diverse group of scientists interested in biochemistry, molecular biology, biomedical research, drug discovery and related areas. Members are from pharmaceutical and biotechnology companies and from university and medical center research facilities across the Eastern United States. In 2009 the collaboration sponsored six half-day symposia (5 - 6 speakers), and two full-day symposia (8 speakers). All events were held at the NYAS on the 40th floor of 7 World Trade Center. All events are open to the public, but there is no admission charge for NYACS and NYAS members. The topics and speakers for these symposia are selected by vote of the membership from approximately 25 potential programs proposed by members of the Steering Committee. The proposed programs are based on many more submitted (any scientist may propose a program). The scientists who suggest the topic then chair that meeting, with support from the Steering Committee. This selection process results in arranging programs of special interest to the membership, with shared responsibilities for their success. For her oustanding work with the Biochemical Topical Group over many years, Dr. Barbara Petrack received the 2008 Outstanding Service Award that was presented in 2009. A new event this year was a Leadership Development Workshop, made possible through a Leadership Development Grant from the Committee on Local Section Activities. The ability to offer an ACS workshop with registration funds provided for a maximum of 20 people was extremely exciting. With so many workshop choices available to us, we decided to take advantage of technology and conducted a Doodle poll, asking responders to pick their top 3 selections, then sending the winning rankings, along with potential dates, to national. The workshop on Developing Communication Strategies was offered on a Saturday morning in September at St. John's University. It was a resounding success! Seventeen participants registered for and attended the course. Of these, seven were people who were not regular attendees at NY Section activities, and one was a new ACS member who had joined the day before in order to participate. Dr. Anne O'Brien was a terrific instructor. The event was enjoyed so much that nine people stayed and went across the street to a local diner for a convivial lunch with the instructor and continued discussion. The year 2009 was a particularly active year for the Committee on the History of the New York Section, as two nominations for designation as National Historic Chemical Landmarks within the New York Section were considered by the National Landmarks Committee. One of these designations (development of the Varian A-60, the first broadly applied commercial NMR spectrometer) was approved and a second (The synthesis of 2-deoxy-2-[18F]fluoro-D-glucose (18FDG) for use in positron emission tomography (PET)) is under consideration by the Committee. This will be the 7th designation of a national Historic Chemical Landmark within the Section, which places the New York Section as number one out of all the local sections of the Society. In keeping with our section goal of growing and maintaining collaborations with other organizations, the History Committee has been working to develop a closer relationship between the New York Section and the Chemical Heritage Foundation, located in Philadelphia. In this regard, the Chair of the History Committee arranged for Rick Sherman, the Director of Development at CHF, to be our keynote speaker at the Section's 2009 Annual Conference. It was apparent that many of our members did not know much about the mission of the CHF, and the wealth of information and programs that are available at CHF to members of the chemical community. Mr. Sherman did an excellent job of informing our members of these opportunities. John Sharkey, Chair of the New York Section's History Committee, is also a member of the CHF Heritage Council, representing the ACS. Dr. Anne O'Brien, a former District 1 Director, has recently been appointed to the Heritage Council by the Chairperson of the Board of the ACS. A luncheon honoring those chemists in the NY Section who have been members of ACS for 50 or 60 years was held on May 28, 2009 at Petrossian's Restaurant, in Manhattan. Forty-eight members were invited, and eleven were able to attend the event. Members of the NY Section Board were asked to assist with transportation, and parking was available nearby for those choosing to drive to the event. All those present had a great time, and requested a 51 year luncheon for 2010! A nice touch by the restaurant was the creation of menus for the occasion, with the ACS logo on the cover. Overall, the food, the service, the ambience, and the company combined to make this a memorable event for all.